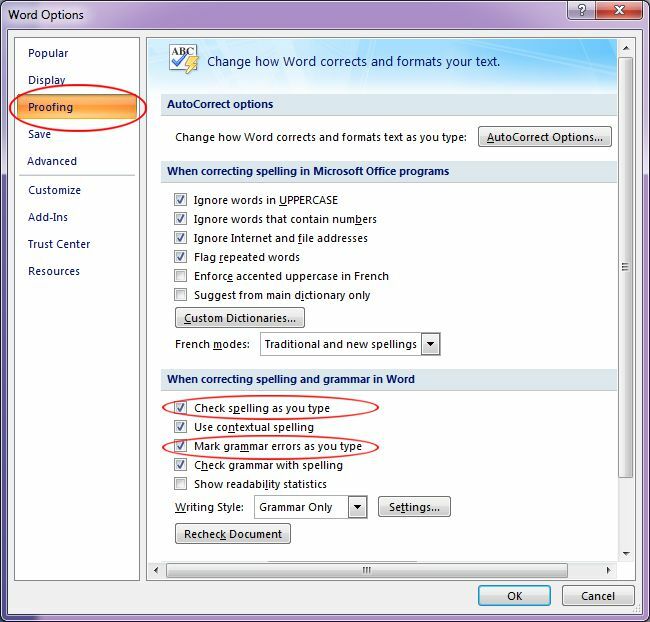 Step-by-step instructions on how to turn off the automatic Spelling and Grammar check in a Microsoft Word 2007 document. You can also choose not to have Word do an automatic spelling and grammar checking of your document. Meaning, you're turning off the red and green wiggly lines. 1. Choose the Office button ► Word Options. 2. From the left side list, click on Proofing. 3. Click to remove the check marks from Check Spelling as You Type or Mark Grammar Errors as You Type options. 4. Click OK once you're done. You'll notice that the red and green wiggly lines are now removed from your text. Just remember, that Word doesn't know when you want to spell check a document or not, you have to tell him that!